Beautiful Michigan beach and resort towns along the west Michigan Lakeshore, offer relaxing , carefree group tour getaways, with miles of Lake Michigan shoreline, exciting attractions, fun events and fantastic sunsets. From Saugatuck to Traverse City to Petoskey, this group tour is jam packed with great food, breathtaking scenery, beautiful shorelines and fantastic shopping... The northern Michigan resort towns of Petoskey, Harbor Springs and Charlevoix are becoming the new favorite destinations for groups visiting Michigan. On your way to Michigan's west coast, your group will enjoy a unique tour and dinner included at a Fruit Farm. Start with a guided open-air excursion around the farm, then dine in the meadow and savor a delicious home-cooked and truly country style chicken dinner. Overnight in your hotel in St. Joseph, MI. Explore the tree-lined streets of the downtown shopping district immediately outside the hotel, or stroll to Silver Beach, one of the top 10 beaches in the country. After breakfast, visit the Silver Beach Carousel, newly constructed and open in 2010, learn the history of Silver Beach Amusement Park and look through Michigan's tallest kaleidoscope. Stay in St Joseph this morning for shopping and lunch on your own. This chic harbor town welcomes you tobrowse through unique shops and enjoy dining spots. Take the Sculp Tour - dozens of marble, wood, stone and bronze sculptures guide your way through town. In Saugatuck/ Douglas artists have been drawn to the areas towering dunes, pristine beaches and natural splendours of this jewel-like setting on Lake Michigan's eastern shore. The town features a broad spectrum of art galleries and art-based activities and events. Consistently named one of America's top 25 arts destinations, it's no wonder the area has become known as "The Art Coast of Michigan"! Then thrill to a guided sand dune buggy ride. This 35 minute exciting tour will take you up and down sand dunes along the shores of Lake Michigan. Your guide will tell you about the lost town of Singapore, the local vegetation and wildlife. Proceed to Holland area to overnight. Your dinner cruise tonight is aboard a 65' Victorian style paddle-wheel river boat that cruises through beautiful Lake Macatawa and Lake Michigan and past the BIG RED lighthouse. Before departing Holland, visit Veldheer Tulip Farm, De Klomp Wooden Shoe and Delft Factory this morning. Veldheers is Holland, Michigan's only tulip farm perennial garden. A stop in the port city of Ludington is great for lunch on your own. Downtown is home to antiques shops, a natural food store, a brew pub, restaurants, clothing and music retailers, as well as arts and crafts shops. 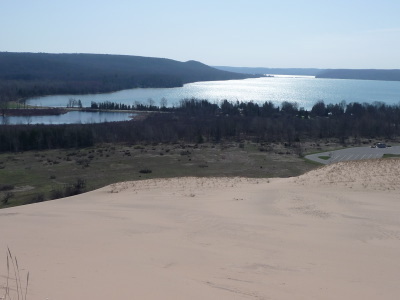 Arrive in Empire, at Sleeping Bear Dunes National Lakeshore, and let your tour guide take you through 7.4 miles of dunes, woods, and breathtaking views of Lake Michigan on Pierce Stocking Scenic Drive. In Glen Arbor, visit the largest cherry store in the world. Strangely beautiful, delicious and eccentric, rustic and friendly, rooted in the region's bounty.The main store is the primary sampling, shopping and gift giving station. You may want to try a delicious Boom Chunka cookie and a coffee. Stock up on everything from jams to salsas to chocolates and more. In Traverse City, check in to your hotel. Dinner tonight is nearby and features one of Traverse City's claims to fame, cherries! This morning start with the Music House Museum - featuring an extensive collection of fine and rare antiques and automated musical instruments in period American settings. Then, depart for a picnic lunch on a two hour Tall Ship sail in the Bay. Enjoy a unique adventure back in time as you discover the beauty of Grand Traverse Bay, Michigan from the deck of this majestic sailing vessel. Many say this is the highlight of the tour! Travel up the Old Mission Peninsula, with your guide to see great views of Grand Traverse Bay, and a historic lighthouse, Old Mission Point. The lighthouse began service in 1870 and rests almost exactly on the forty-fifth parallel, halfway between the pole and the equator. Stop at a boutique winery on the peninsula for a wine tasting . Dinner included tonight is in a historic tavern on the peninsula. Meet your tour guide today and travel north along one of northern Michigan's most scenic stretches. Quaint cherry orchards, rolling hills, views of Torch Lake and Grand Traverse Bay are a few of the things that you'll see along this route. Stop at a Cherry Orchard, where their roadside stands are chocked full of fresh bounty from the area. You might want to enjoy a wagon ride tour here. 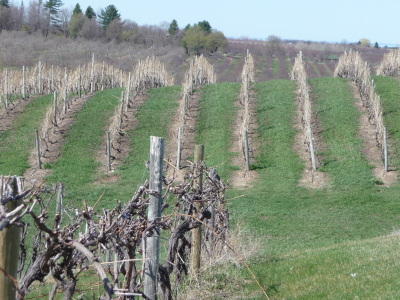 Depart for beautiful Charlevoix area and stop at Castle Farms, your guided tour. Your visit will include the beautiful gardens, the Museum Collections, and the magnificent French Chateau style buildings. 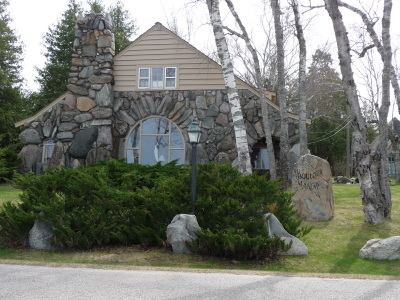 Your guide in Charlevoix will show you Earl Young's famous Mushroom Houses - Hobbitland . mushroom homes . elf space . gnome houses . Smurfsville . the creations of Earl Young are known world-wide. And the only place you can see them is Charlevoix. Arrive in Petoskey for your overnight stay in an historic elegant resort hotel. Experience the grandeur and elegance of a by-gone era without leaving modern day conveniences behind. Meet your coach and step on guide, depart for a two hour tour of Petoskey, Harbor Springs and the view at The Inn at Bay Harbor and Glenn Drive. 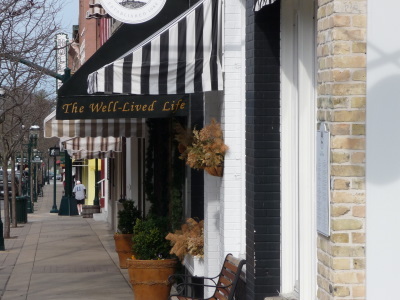 Enjoy some free time downtown Petoskey on your own, many delightful shops and restaurants.